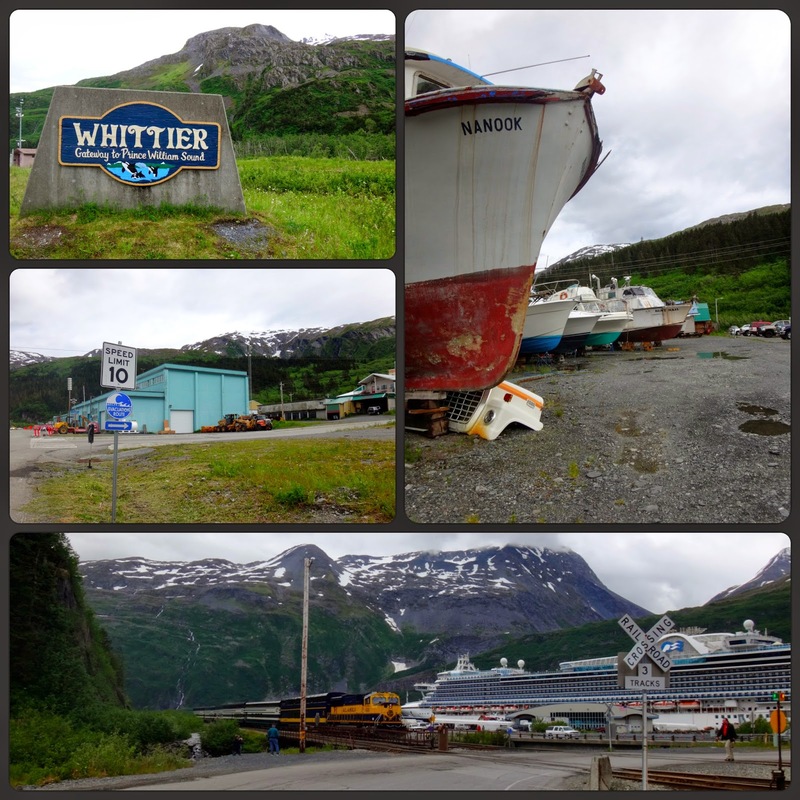 After our morning in Anchorage, we headed 75 miles south down the Seward Highway then east along the Portage Glacier Highway port town of Whittier. Well....what can I say about Whittier.... an interesting dynamic it has. It is a very tiny town along the Prince William Sound with a population of about 177. Yes- one hundred and seventy seven people small but packed full of history. To get there you have to go through the Anton Anderson Memorial Tunnel also known as the Whittier Tunnel. This 2.5 mile tunnel originally constructed during the years of 1941-1943 cuts through the Maynard Mountain and is the second longest tunnel in North America. It's single lane accommodates both auto and railway traffic with directional flow controlled by two sophisticated computer systems. What do you suppose they did way back in the 40's before the grand computer invention? Maybe a flag system? 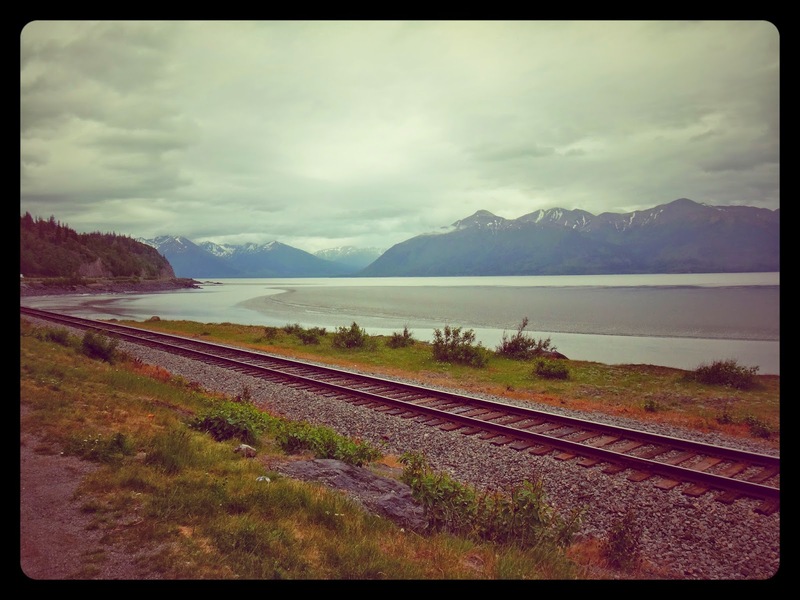 En route to Whittier along the Seward Highway. A train just having exited Anton Anderson Tunnel. We are waiting to go through the tunnel in the line of cars on the right. There are a few things that make Whittier so unique. It is probably most well know as a popular port of call for numerous Alaskan cruises. Some extra inquiry and you will also discover that this small port town has a ton of history. During WW2 the U.S. Army constructed a military facility complete with port and railroad. The town eventually became a secret entry point of U.S. Soldiers into Alaska. Constructed during that time were two large buildings to house the soldiers. These buildings pretty much make up Whittier. They are enormous in comparison to the rest of modest town. 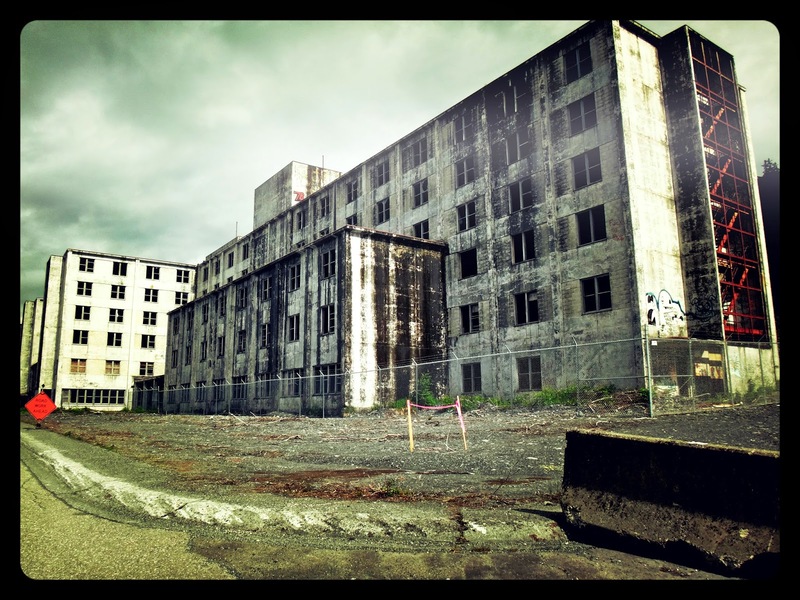 The one building- The Buckner Building was once the largest building in Alaska on its completion in 1953. It was occupied by U.S. troops until 1960 when the Army left Whittier. It has been vacant ever since. Just another example of waste in war- a 14 story building, occupied for only 6 years then completely abandoned never to be lived in again. Recently, the government owned building is now under consideration for either restoration or demolition. Speaking only as a measly outsider, it would be nice to see something come of the building, if salvageable. With the port and the breathtaking backdrop of the glaciers and the mountains, it makes for a perfect little piece of nordic paradise. 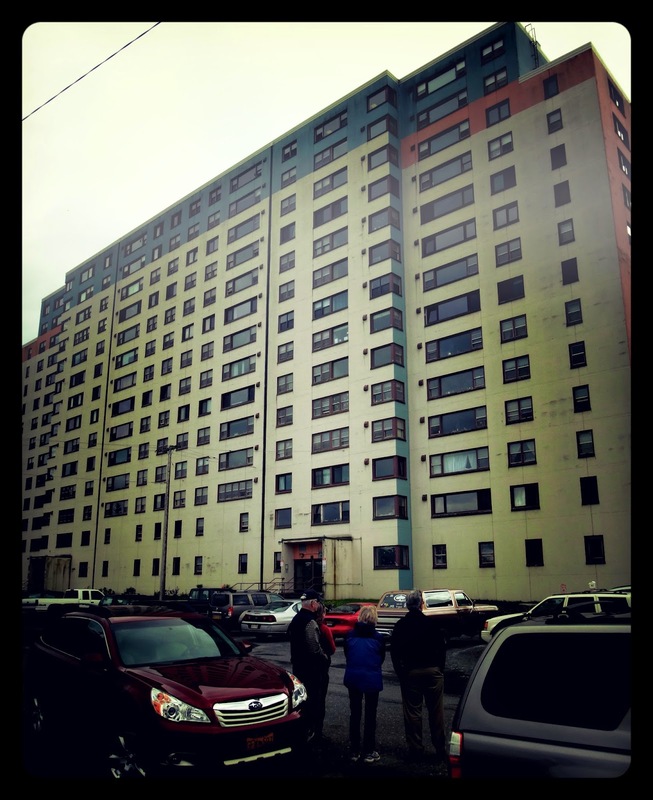 The other building- The Begich Towers, still functions as housing for a majority of residents who live in Whittier. Interestingly, this building also serves as the city's business center. The first and fourteenth floor are zoned commercial and the rest house many of the towns businesses including the police department and medical offices. Of course you can imagine how convenient and warm this makes things for the residents living in the 196 units during the cold winter months. There is even a tunnel that connects the towns only school of 37 little eager beavers of all grade levels. Brilliant. Amongst all this history and tucked away next to the town's convenience store and hotel is a superb little Museum- The Prince William Sound Museum. This 1000 sq ft museum is packed with some well done and interesting 22 exhibits that outline Whittiers unique history including displays about the Cold War and WW2 as well as the 1964 Earthquake that destroyed much of the towns lumber trade. With it's $3 adult admission and its proximity to the ever so busy cruise terminal, it is well worth your while to visit. hotels, and good Alaskan brew. 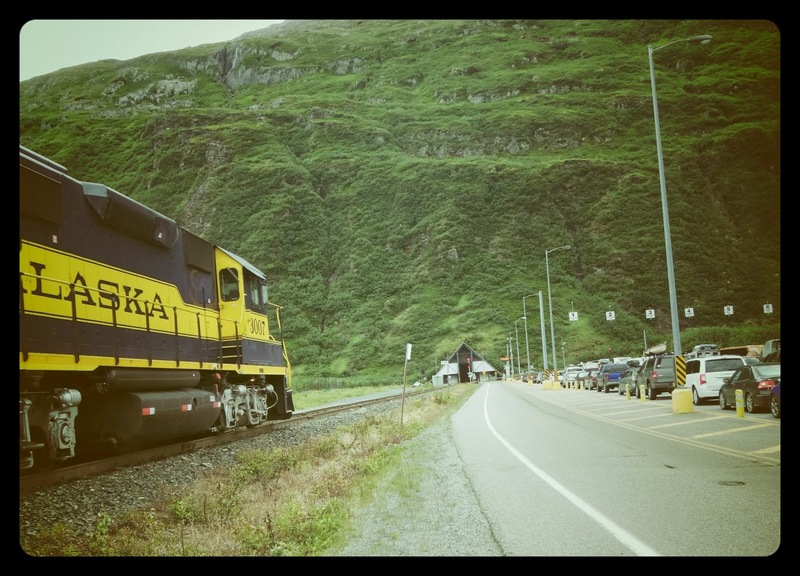 If you want to learn more about Whittier start watching my new favorite show, a Destination America series titled Railroad Alaska where Whittier is one of the shows featured towns. It's an Alaskan town of laid back but hard working, down home good all around people. My kind of place... well with one exception, brrrrrr. Although I was staying in a downtown hotel, I found Anchorage streets to be rather empty of both cars and people. 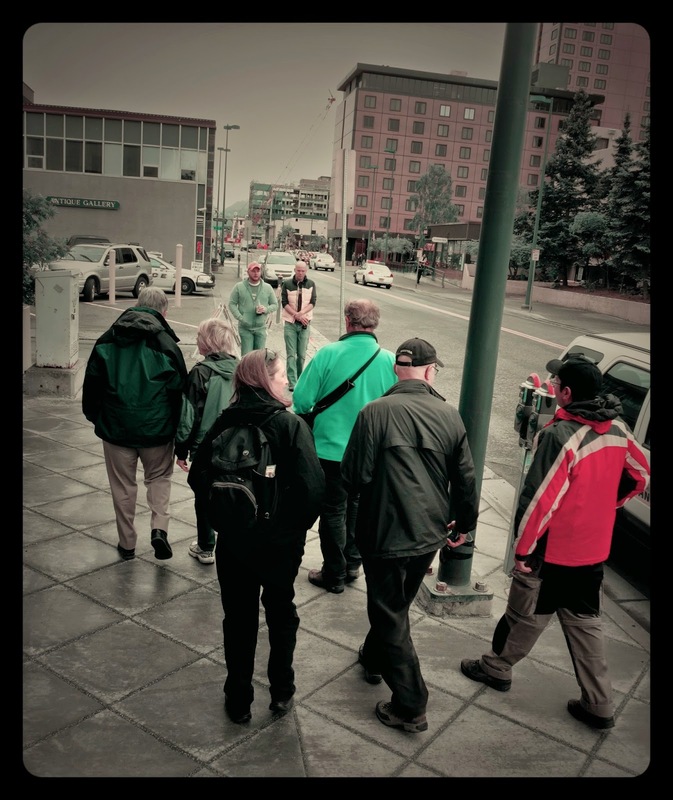 A light drizzle fell on me as I enjoyed my cool morning fourteen block walk to breakfast to meet the rest of my, now 2015, Aleutian voyage ship mates. I arrived early, snapping pictures along the way and really observing the life of the city. That is one of my favorite things to do when I travel- to sit back and get immersed in what makes that city, well, that city. I walked down historic 4th Avenue, past the old Army & Navy store still in business. 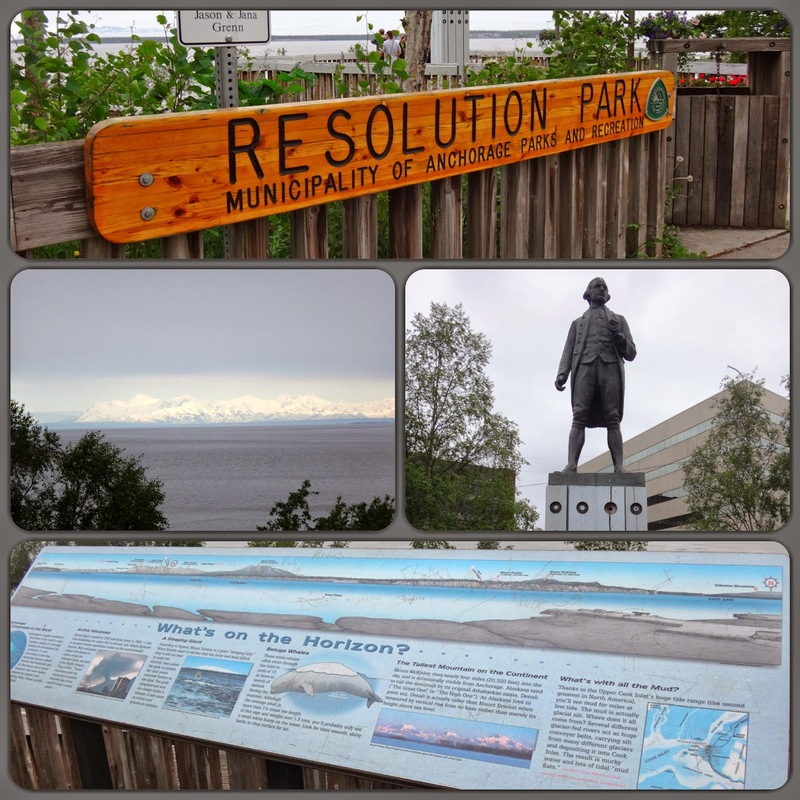 Passed the preserved and still functioning City Hall, numerous fur trading stores (sans a single protester), the Nesbett courthouse flanked by two totems, too many to count tourist shops, and ended up at Resolution Park overlooking the Cook Inlet. The Cook Inlet of course, named after Captain Cook, the famed explorer who explored this passageway in 1778 aboard the HMS Resolution. On a clear day, from the parks boardwalk, you can see North America's tallest mountain- Mt. McKinley. 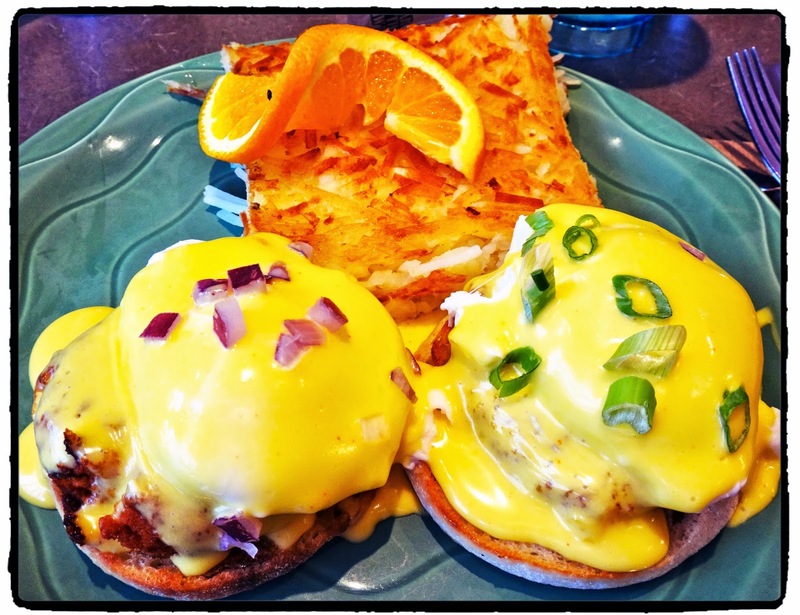 Our group met at the most popular breakfast spot in town, the Snow City Cafe. I had arranged a breakfast with author Mary Breu. Mary's book- Last Letters From Attu, is about her great aunt- Etta James, who was a school teacher on the far westward island or Attu when on June 7th 1942, 1,200 Japanese first invaded. Etta's husband was senselessly killed and one week later she was taken to Japan where she was held captive for four years. In the book Mary tells the story, almost through the eyes of her aunt, based on numerous family documents, letters and photos from Etta's personal collection that were eventually handed down to her. A fabulous read. With our full and satisfied bellies we made our way on foot, through the middle of a gay pride rally that just so happen to be right outside the restaurant. I was actually thrilled to see that even in the most northern state there was a place for people to express themselves for who there are. Rock on. L-R Front Row- Col. John Cloe- Alaskan tour leader, John's wife, Michel from the Netherlands. We headed east towards the Alaska Veterans Museum. This non profit organization has been around since 2001 but the museum on 4th Avenue opened its doors in 2011. 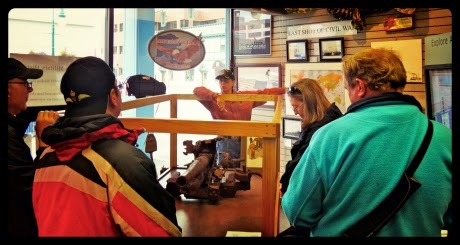 It is packed with history and artifacts of Alaska in war. 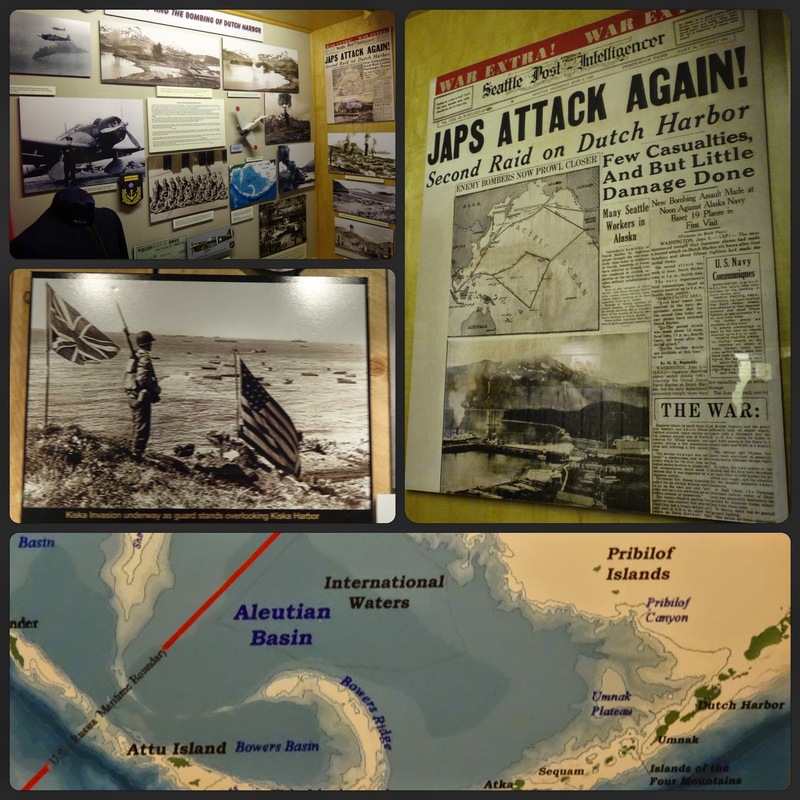 They have also had numerous popular exhibits displayed at the Anchorage Museum. That is actually how it all began for them. Its mission is to create a space for the inspiration, remembrance, and preservation of veteran stories and their sacrifices. 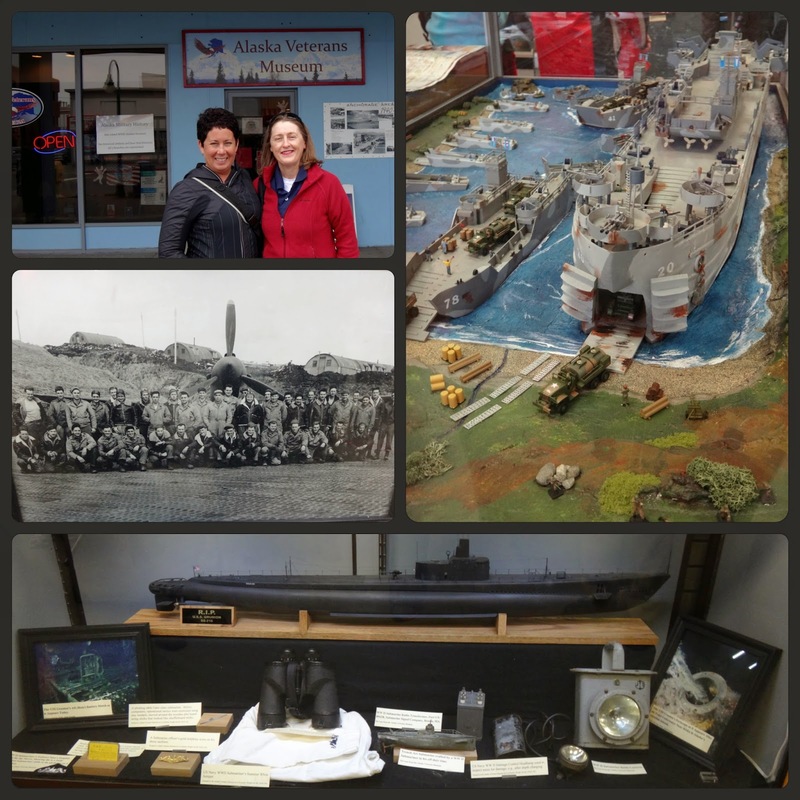 It also serves as a place to educate the general public through the collection, presentation, and exhibition of artifacts, personal accounts and historical facts relating to the history of Alaskan Veterans. Current Executive Director, Col. Suellyn Wright Novak was a wealth of knowledge and a tremendous hostess. Her passion for history was infectious. 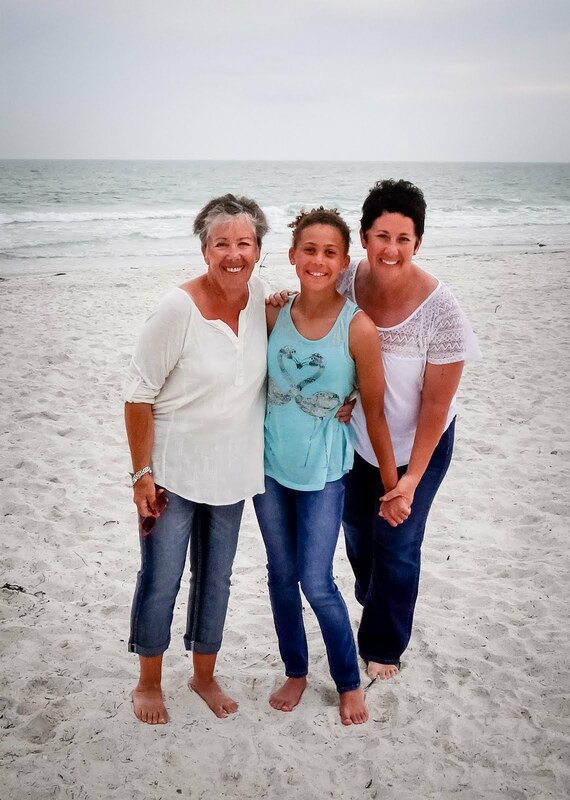 Executive Director Suellyn Wright Novak is in the middle. USS Grunion exhibit. USS Grunion sank around Kiska Island, July 1942. This was the R.C.A.F. 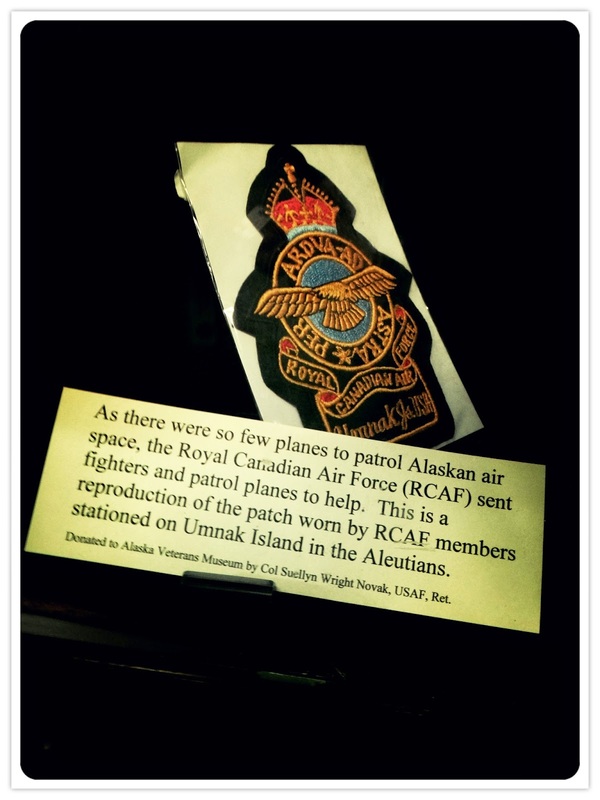 badge that was on display in the museum. It was housed appropriately with the 11th Air Force. And perhaps another under recognized persons in the war were the local villagers. This statue represents the Alaska Territorial Guard. This group of local volunteers were a crucial piece in guarding such a vast land against enemy attack. This statue stands guard outside the museum. were instrumental in the battle for Attu, a foreign war battle fought on domestic soil. If you find yourself in Anchorage, this is a must see. And if you do not find yourself in Anchorage but would still like to support the Museum, you can become a member or simply make a donation. Great first stop! 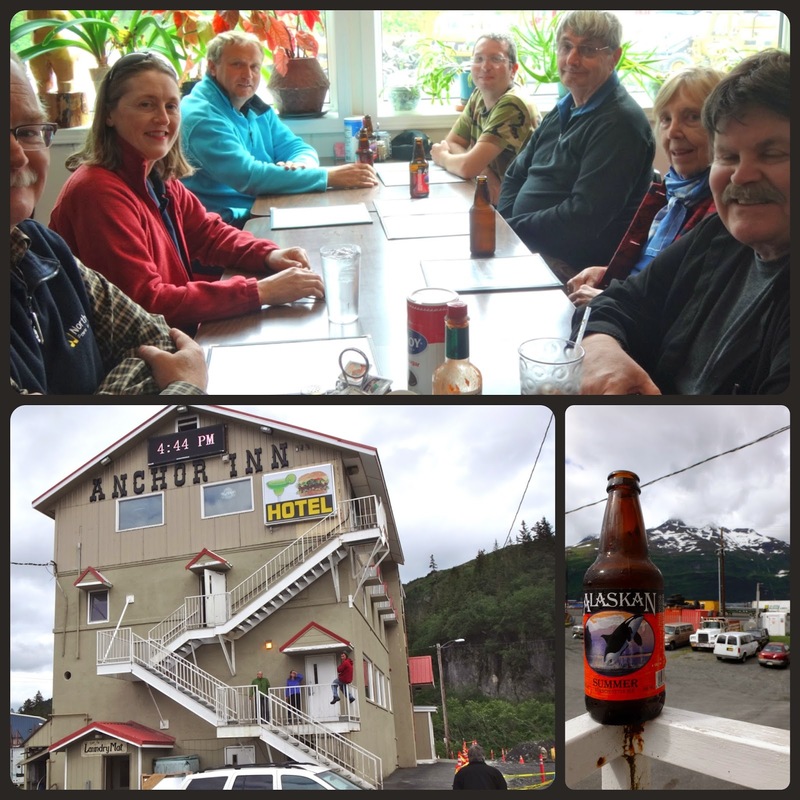 It has been a few weeks since returning from part one of my Alaskan voyage. What a whirlwind of a month and a half it has been. I needed some time for the realization of this whole experience to sink in. It was an incredible trip which I will now start to share. When I started this blog a few years ago, and began my research into my Grandfathers war experience, I had no idea where it would take me. Well, actually that is not an entire truth, I knew the direction I wanted it to go, I just never imagined the scale in which it would manifest. And really, I still do not. This is, by no way, over. It does not matter how many times these things repeatedly happen in my life, it never ceases to amaze me when my visions comes to fruition. When I look back in wonderment, the one common denominator, is the presences of an undeniable gut feeling that whispers "This is the way". And it is from that feeling that I move forward. If I was to collect a dollar every time I received the look of doubt and disbelief from my friends and family when I tell them an idea or feeling I have.... boy, I would be one wealthy women. I mean some of my aspirations are out there and seem so unrealistic or unattainable that, heck, even my own logical mind tells me I am pushing it sometimes. But it is a darn good thing my gut speaks louder (most of the time) because it has gotten me to this point so far. Anyways, on to the juicy details of my adventure. Since there is so much to write about, I thought I would break it up through out the next few weeks. So keep checking back. We landed in Anchorage 3 hours late, around 11 p.m., after a long flight delay. (United Airlines, I will spare you the embarrassment and refrain from sharing with everyone the travel nightmare I experienced with your airline...wow.) It was daylight still which was nice in a way because it gave me a chance to see some of the city on my taxi ride to the hotel. It was after midnight when I checked in, and even after 19 hours of traveling I was still up for a walk. So off I went. At 1 a.m., I walked four downtown blocks to get myself some bottles of water. Crazy. The streets in Anchorage were spattered with near by club goers. Along the way, I passed several people, although slightly sketchy, walking on the sidewalk. When I finally got back to my room I had to force myself to close the curtains so I could go to sleep. The continual daylight was actually one of the hardest things to get used to. View from my hotel room around midnight. When I awoke bright and early the next morning, I opened the curtains only to find the same amount of sunlight shining as when I had shut the drapes 5 hours earlier. It is a workaholics dream. I mean, my body is so in tune with its circadian rhythm that I instantly feel sleepy as soon as the sun goes down and the opposite when the sun rises no matter how late I go to sleep. That being said, the sun never went down so I never felt sleepy unless I intentionally made the room dark and laid down. If I lived there year long I could really envision myself working non-stop during the summer. Obviously, the flip side to this is the amount of darkness Alaskans experience when it is winter, in which case during that time I would most likely become bear like and hibernate eventually leading to my unemployment and homelessness. Not so good. In the morning, as I sat fireside sipping my java in the impressive Anchorage Sheraton lobby, I began a long conversation with one of our United flight attendants who unnecessarily kept trying to apologize about the previous night's flight debacle. She was very sweet. Even gave us free beer during the flight to try to smooth things over... until they ran out not even half way though the seven hour trip...Yep. It turns out her grandfather was a WW2 vet. 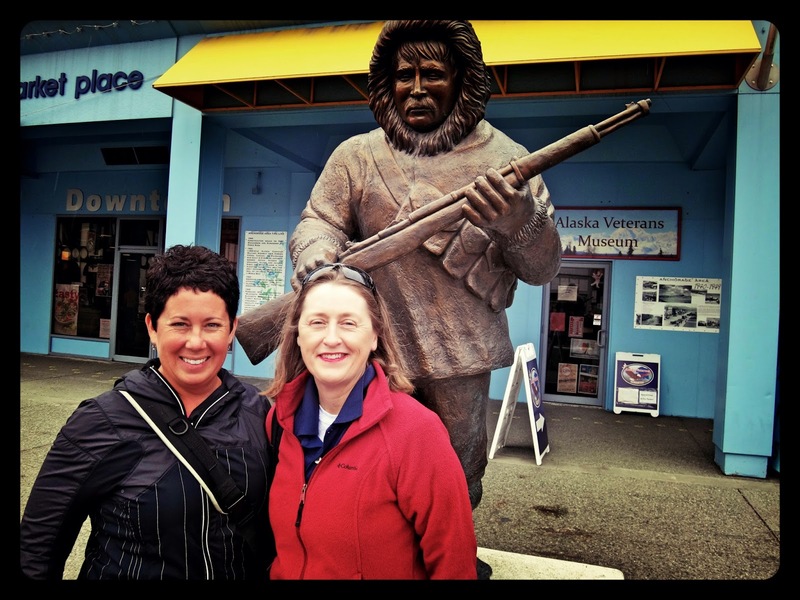 Although not in Alaska she still had some great stories to share. Also, on this morning, the lobby was filled with many members of the Air Force all running around in their flight suits. Very neat. They were in Anchorage for a training at Elmendorf Air Force Base located close by. Talk about adding some authentic ambiance to my trip. Here is my Papa with his flight suit. Looks like he is just securing the parachute to complete his ensemble.